As you are aware, Simple Inked is as flexible as you are. You can take it with you, login from anywhere and access it on any computer or device. You can however ensure that you Studio Managers and Staff are locked out of using Simple Inked outside of the studio. Before we go any further, you need to login to Simple Inked on your STUDIO COMPUTER (or device). Whatever you and your staff use to access Simple Inked on. To get this set up, (on your studio computer) go to your Settings section and select Global Lock Out Settings. At this point, you have locked all computers and all devices, in all locations (including the computer or device you're on right now). 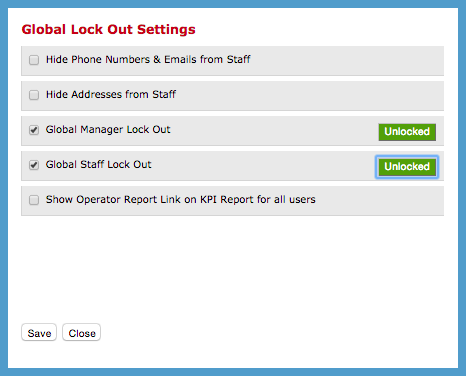 Now you need to click the red Locked buttons to display the green Unlocked. You have now unlocked this computer, so your Studio Managers and Staff users can access Simple Inked on this computer. Now Save these changes. You'll now need to login to Simple Inked on all computers and devices which Studio Managers and Staff DO need to access Simple Inked on, and click the red Locked to display the green Unlocked, then Save.